This eBook was produced by Paul Moulder and Roy Glashan. Angus proves himself a detective who won't take "Guilty" for an answer. THE Hon. George Angus, pleased with the world, happy at the freedom from sartorial restraint indulged in at this his favorite annual holiday, strolled along the lawn at Goodwood toward the grand stand, his card in his hand, waiting for the numbers to go up for the next race. At the corner of Tattersall's inclosure he came face to face with Charles Hunley, the famous King's Counsel, a fellow member of his club, but a man with whom he had only the slightest acquaintance. Rather to his surprise the barrister stopped him. The usual casual greetings were exchanged, and afterward Hunley took his companion by the arm and led him back along the lawn. "I wonder, Angus," he asked, "whether you remember the Coulson case, about four years ago?" "Can't say that I do," he confessed. "What sort of case was it?" "I suppose it was before you entered upon your peculiar line of activities," the K.C. mused. "The case was The Crown versus Coulson, and I was for Coulson." "Murder! We got it reduced, during the hearing, to manslaughter, and the jury, if they could have done so, would have let the man off altogether. Would it bore you if I just run over the case for a minute? Ill tell you why afterward." "Of course not," Angus replied. "The numbers won't be up for another quarter of an hour. Have a cigarette." He passed his case. The two men sat down upon an unoccupied seat, and Hunley looked thoughtfully for a moment out across the richly wooded country toward the Solent. "Coulson was an accountant's clerk," he began, "married to an actress—dead wrong 'un, I should say the lady was. He came back one night and found her in flagrante delicto! Coulson was a small man, but as brave as a lion. He went there and then for his wife's lover, and they had a devil of a time. The other fellow was twice his size, but just as Coulson was passing out he snatched at a heavy copper ornament on the sideboard, fetched his opponent one just at a particular spot at the back of his head, and, in short, killed him. Coulson himself was in a hospital for five weeks before he could be tried, and if the judge and jury could have had their way I don't believe he'd have gone to prison for a day. As it was he was charged as soon as he could stand up, and got the lightest possible sentence—three years, with a strong recommendation to mercy. That was about two years and six months ago." Angus nodded. "With good-behavior remittance," he remarked, "he'll be out directly." "He's out now," Hunley announced. "I've just seen him." "I went up to bet with Sammy Martin in Tattersall's ring," he confided, "and I noticed that he had a new clerk. I didn't recognize him at first. He's a pale, undersized, shrunken little fellow. Then he looked up, and I knew him. He knew me too." "Rather a comedown for him, isn't it?" Angus suggested. "I should have thought if his case had excited so much sympathy one of his pals could have found him a better job." HUNLEY looked for a moment idly into the faces of the passers-by. "I'm afraid it's one he chose himself, Angus. You see, I kept my mouth shut, of course, for I wasn't going to do anything to aggravate the case against him, but it fell to my lot to tell him at the hospital that the man was dead and that he'd be charged with murder." "Yes, but not in the way you'd have thought," Hunley continued, taking out his glasses for a moment and looking at the numbers which had just gone up. "1, 3, 5, 8, 11. If you want to be off, I'll finish presently." Angus glanced at his card. "Nothing doing," he decided. "There's only one horse in it and no place betting. I shall have a rest. Besides, I'm interested in what you are telling me." "He smiled again. It wasn't a smile, Angus. It made me curious at once to know what was at the back of his mind. And then I asked him point-blank. He hesitated only for a moment. 'The first luxury I shall enjoy when I am free,' he confided, 'will be to kill Ada. I hadn't the strength that night.' ... The man's character came out in the evidence. He was a mild little inoffensive accountant's clerk, saving money every week, wonderful at his job, thought the world of by his employers—they paid for his defense, by the bye—a man whom all his neighbors liked, although the men called him rather a milksop, and he lay there, just come back from the borderland between life and death, and in perfect sincerity he told me that the only regret he had was that he hadn't been able to kill the woman with whom he'd been living for eleven years!" "He has probably changed his mind after all this time in prison," Angus observed. "Maybe," he admitted, "but I fancy not. I spoke to him just now. He pretended not to recognize me, but I tell you, Angus, there was exactly the same look in his face when I talked to him that day in the hospital and when I said good-by to him before he went down to the cells." "What has become of the woman?" Angus asked. "That is where the drama of the thing comes in. She is here, on the course, and I am perfectly convinced that Coulson has only accepted this job with a bookmaker because he knows that sooner or later he'll come across her. Racing—it came out at the trial—was her downfall. She could never refuse an invitation to a race meeting. It was there she met the man whom he killed, and I'm very much afraid, from the look of things, that she's found another protector of the same kind." "Have you ever spoken to her?" Angus asked. "She ought to be warned." "I shall do that," he said. "I thought I'd tell you this, Angus, because one or two of your little exploits have come my way, and I felt that this was the sort of affair which might interest you. Knowing the man, I'm afraid there's nothing we could do, unless we could keep them apart, and I honestly tell you that I don't believe that's possible. I have the feeling that if she were to change her name and bury herself in San Francisco or New York, or find her way to the Falkland Islands or the steppes of Tatary, he'd find her. He's that patient, dogged sort. He'd come quietly along one day, and before she knew he'd be there with that queer smile of his. I'd do anything to prevent trouble, because I rather like the little fellow. He's been treated leniently once, but if he kills the woman he'll swing for it." "Where is the woman?" Angus inquired curiously. The K.C. rose to his feet and brushed some cigarette ashes from the waistcoat of his neat gray tweed suit. "She's in the third automobile from the entrance in the front row," he confided, "dressed in rose color—you can't mistake her—with a black hat. Go and have a look at her, and then make a little bet with Martin. You can mention my name. By the bye, are you staying down here?" "I'm over near Chichester, with some friends," Angus replied. "We shall meet again then," were Hunley's parting words. "I'm coming every day, and I suppose you will." The two men separated. Angus strolled from the lawn into the Royal Automobile Club inclosure, and loitered by the third car—an ostentatious-looking limousine, painted red, with brass lamps and showy carriage work. There was no mistaking the woman—a slightly faded type, with masses of fair hair, of which she made a brave display; large eyes, artificially beringed; features which might once have been good but which showed signs now of coarsening. She was standing by the door of the car, her card in her hand, talking eagerly to a man who looked like an overgrown jockey in a consumption—a man with a keen, hard face, thin lips and narrow eyes, but with a pasty, almost green complexion. He was watching the horses go by, and the very way he glanced at them seemed to indicate knowledge. The woman hung upon his scant words. They seemed to be without any other companions, but a large luncheon basket stood open, and there were two or three empty champagne bottles scattered around... Presently there broke the hoarse murmur of voices which, with the accompanying bugle, denoted the start of the race. The woman thrust her hand into her bag and took out a small handful of notes. She passed them over to the chauffeur, who hurried off toward the bookmakers, who were crowded around the rails. Then she climbed to the back seat of the limousine, and stood there, the glasses glued to her eyes. GOODWOOD was at its best that day. The sun was warm, but not oppressive; the south breeze which stole over the open country brought with it a flavor of the sea. The long rows of tents set among the cool of the trees were more than ever inviting. Royalty was present, and the boxes were filled with women in graceful summer costumes. The long season had come to an end, and the world was on holiday. Angus, from the rails in front of the lawn, watched the finish of an unexciting race, joined his friends for a time in their box, and afterward strolled once more to Tattersall's. Mr. Sammy Martin greeted him cheerfully, and accepted his modest bet with enthusiasm. Angus, while he asked for some other prices, glanced at the little man busy entering his name in a book. For a moment he had almost a shock. He had somehow gathered from Hunley's description that the central figure in this sordid drama was barely more than middle-aged. The man's hair, however, was iron-gray, his face almost phenomenal. He was like the tragical lay figure of some ventriloquist—the perfect human automaton. One could scarcely believe that he really heard or that the words which passed from his lips were not mechanically contrived. Angus made another and a foolish bet for the sake of lingering. AS HE turned away he ran once more into Hunley. "Well, I've seen both figures in your little drama," Angus confided as they moved off together to have a drink. "They are in their way interesting. Is there anything to be done?" "Nothing. I daresay the whole thing will fizzle out. I've been talking to Coulson." "I asked him why he was doing such work when I happened to know that his old firm would have taken him back. His only reply was that he could never bear the life back in his old office. He was perfectly satisfied. Martin told me that he was the best clerk he'd ever had." "You think he's only taken the job to watch the race courses?" Angus asked. "I'm sure of it," was the terse reply. So was Angus sure of it on the following morning before the first race. There was no mistaking the stiff little figure in plain dark clothes and derby of whom he caught sight within five minutes of his arrival. In an unostentatious way he kept him in view for the best part of an hour. He saw him walk slowly past the seats on the lawn, pausing to examine every car, watched him make a circuit of the tents where refreshments were already being dispensed, waited for him half an hour while he made a tour of the grand stand and boxes, and finally, on the other side of the railings, walked in line with him as he made his way slowly toward the front of the R.A.C. inclosure. Suddenly the red car appeared—open too, as Angus noticed with a little sense of disquietude. The man and woman were there, still alone, the woman in blue with a large picture hat, under which, notwithstanding the brilliant coloring of her lips, her features seemed more pinched and her eyes deeper set even than on the day before. They drove into their place. The man lit a cigar and stood about with his hands in his pockets watching the luncheon basket unstrapped from the back. The woman sat for a moment or two looking into a small mirror and arranging her slightly disordered hair. As soon as she was satisfied, she too stepped to the turf. If Angus had expected anything in the nature of a dramatic rencounter, he was doomed to disappointment. The man and the woman stood side by side studying their cards—the man sallower and more unprepossessing in appearance than ever as he puffed stolidly at his cigar without removing it from his lips, his head almost touching his companion's. At first it seemed as though the sinister searcher would have passed them without recognition. Angus, a little in the background, watched his slow approach, took note of the set immobility of his face. He was looking from side to side without obvious curiosity, yet with an air of patient expectancy. He reached the car. He was in the act of passing when, by some chance, the woman looked up and glanced over toward the number board. She saw nothing of the insignificant little person a few yards away—but he saw her. Not a muscle of his face moved, not a gleam of satisfaction shone even in his eyes. He slackened his speed, however, drew a pencil and notebook from his pocket and made a note of the number of the car. The man and woman were again busy with their cards, but the chauffeur stood almost in Coulson's way. The latter addressed him, and Angus, by moving a step forward, heard his question. "Isn't your master's name, Pallett," he inquired—"Andrew Pallett, of Sydenham?" The chauffeur shook his head. "We live out at Hampstead," he answered—"Carnsforth Buildings. That's the governor there. Merridew, his name is." "Thank you very much," Coulson said. "A remarkable resemblance." HE WALKED on. His search was ended. He looked neither to the right nor to the left. Yet, as he passed within a few inches of Angus, there was not a single sign of satisfaction in his face. He had found out what he had become a bookmaker's clerk to discover, but, so far as outward appearances were concerned, his success had left him indifferent. He was looking just the same when, before every race, drawn there by some attraction which he failed to analyze, Angus went up to make some small bet. Down in the automobile inclosure, after luncheon, the woman's peaked face became flushed, she exulted loudly over a win, she sat arm in arm with her companion, smoked a cigarette or two, and promenaded the lawn, still gripping his arm, but back in Tattersall's inclosure the little clerk's pencil moved swiftly and always with deadly accuracy. Once more he had become the automaton. So he remained until the end of the meeting, and Angus' final glimpse of him was as he followed his principal out of the inclosure some time after the last race, a soiled blue mackintosh buttoned up to his chin for shelter against the sudden squall of rain, his satchel under his arm, his eyes fixed upon his employer's broad back. Angus watched the two climb into a car together, and start off Londonward. A few minutes later Angus, driving his own coupé, had to draw up while the stream of automobiles crawled by on their way to the main road. Among them was the red car, also turned Londonward. 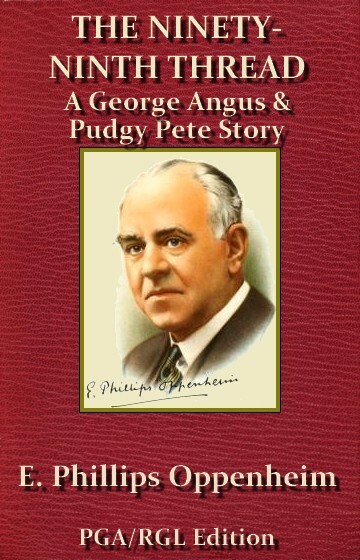 PETER BRAGG, alias Pudgy Pete, Angus' partner, had absented himself in Monte Carlo for two months during the winter season, so Angus, after Goodwood, found himself with a prolonged vacation on his hands. Yet when he strolled into his office, bronzed and cheerful on the first day of his return to London, he found, seated in his clients' chair, the little man whom he had never altogether forgotten. "This gentleman is waiting to see you," Peter Bragg explained after he had shaken hands. "He wouldn't confide his business to me—says you would remember him." "I remember you, of course," Angus said, turning to his visitor. "Mr. Hunley told me your story, and I saw you at Goodwood." "I saw you too, sir," Coulson observed. "I felt that you were interested—I knew that you were when you waited in the R. A. C. inclosure to see whether I should find my wife and Merridew." Angus nodded sympathetically. "I hope you've got over all that nonsense you were talking to Mr. Hunley," he said. "Perhaps I have, and perhaps I haven't, sir," was the quiet reply. "Have you seen the papers this morning?" "Better read about a certain shooting case first, sir, before I explain my business," Coulson suggested. There were very few details. A man named Merridew, a betting agent, and a woman bearing the name of Coulson, although she was supposed to be divorced from her husband, had been discovered by one of the servants at Carnsforth Buildings, Hampstead, dead, early in the morning, both shot through the head. A revolver had been found by the side of the man, and an arrest was expected hourly. Angus threw down the paper and turned to his visitor. "I have some facts to lay before you," the latter announced calmly. "Please both listen. Two heads are better than one. The woman was my wife. I killed her first lover and went to prison for three years for it. I swore when I came out that I meant to kill her and, if she had found another protector, to kill him also. That is common knowledge. I have loitered in the neighborhood of that flat in Hampstead for weeks, keeping them always in a state of nervous alarm. They have told a dozen people of their terror of me. I visited them at the flat last night. The revolver found by the side of Merridew is mine. I believe that I was seen to enter and leave the flat, yet I did not shoot either of them. They were alive when I left them. I have no idea how they met their death. I know perfectly well that I shall be arrested before the day is over. Will you do what you can for me?" Angus sat back in his chair. A fit of speechlessness was upon him. His partner leaned across the table. "Listen," he said. "Let me get this right! You killed the woman's first lover. You went to prison. You threatened to kill her when you came out, and anyone she might be with. You've hung around their flat. You were seen to enter it last night. They are both shot dead. Your revolver is lying on the floor. You were seen to leave the flat. What chance, I ask you, has anyone got to do anything for you?" "There must be a chance somewhere," Coulson insisted, "because I did not kill them." "What did you go there for, then?" Peter Bragg asked patiently. "To tell them that I'd changed my mind. I have turned over a new leaf. I am engaged to be married." "If your present story is the true one," Peter Bragg remarked, "I think that coincidence has made you the most unfortunate man in the world." "Listen here," Coulson continued, addressing Angus. "I've heard about you. You're not in this business like the police, to worry along the routine ways. Here is your one chance in a lifetime. On the face of it, it's a hundred to one that I'm guilty. I'm not. Try to find that ninety-ninth thread." "Can you help?" Angus asked. "I cannot," he admitted. "I am just like everyone else will be. I should believe myself guilty if I didn't know I wasn't." "I'll do what I can," Angus decided, "but I warn you—"
"You needn't trouble," the other interrupted. "I'm not going to attempt to get away. I shall be arrested before the day is out, of course. I shall spend the night in the prison cells, trying to imagine what happened." "One word more," Angus begged, with his hand upon the door knob. "There's no question of suicide and murder, I suppose?" "Why should there be?" was the hopeless rejoinder. "They appear to have been the most devoted couple—never seen apart, and Merridew is supposed to have been a very wealthy man. I'm afraid the neighbors' evidence would soon settle that. You'll do your best, Mr. Angus?" "I'll do anything that can be done," Angus promised, a little dubiously. ANGUS dined a few nights afterward at his club with Hunley. "So our little friend kept his word," Angus observed. "Silly fool!" he muttered. "He got off once, and now he must go and absolutely pay for what he's certain to get. I'd defend him if he had a leg to stand on, but he hasn't. To make things worse, he's lost his nerve—wants to plead 'not guilty.' "
"I suppose there's no doubt that he did do it?" Angus asked. The K.C. shrugged his shoulders. "My dear fellow," he pointed out, "he announced his intention of killing them right and left. He's been frightening them to death for weeks. He's somehow or other become possessed of a key to their flat. He's seen to enter it; he's seen to leave. His revolver is found there; the two are dead." "I know," Angus remarked, "but he says he didn't do it." "Every man's nerve breaks now and then." "Can I look over the rooms?" "If you wish to, with pleasure. I'll give you a card to Ryan of Scotland Yard. He's in charge. He'll be there tomorrow, I believe." Hunley drew his case from his pocket, scribbled on the back of a visiting card, and passed it over to Angus. As though by common consent, they dined thenceforward without a mention of Coulson's name. Angus, however, excused himself from bridge afterward. He spent the rest of the evening in the neighborhood of Carnsforth Buildings. AT ELEVEN o'clock on the following morning Inspector Ryan and Angus ascended by the elevator to the fifth floor of Carnsforth Buildings, and the former exchanged a word or two with the policeman who was on guard at the entrance to the flat. It was that few minutes' conversation which probably saved Coulson's life, for in the interval of waiting and looking around Angus was attracted by the letter chute just outside the door. He studied it for a few minutes thoughtfully. Presently the inspector produced his keys, and they entered the darkened hall and passed into the sitting-room which had been the scene of the tragedy. The inspector took Angus by the arm. "I don't know that there's much to show you of interest here, sir," he remarked. "The chalk marks show just where each body was lying. Look round the room as much as you like. My job this morning is just to see if there are any bullet marks in the walls. Nothing else has been touched." Angus, with a little shiver, drew up one of the blinds, and took stock of his surroundings. The room was furnished as might have been expected—with a certain amount of ostentation, but a great deal of vulgarity—heavy plush chairs with carved oak backs, an elaborately carved sideboard, a thick carpet, a number of meretricious ornaments, a piano draped with faded silk, photographs in silver frames, even a few fans upon the walls. In a corner of the room was a small writing table. "Have you the key to this, Inspector?" Angus asked. The inspector nodded, and selected one. "We've been through the contents," he observed. "Very little except bills and sporting tips. We didn't disturb things more than we could help. There wasn't anything to look for, really." The inspector turned the key, and the top slid down. Inside there was a blotting pad and an inkstand. The pen, Angus decided, had probably been used within the last few days, and there was still ink in the pot. The blotting pad he lifted out and took to the light. "There's an address of a letter here, Inspector," he remarked. The inspector was not greatly interested. "Might have been written at any time," he commented. "Besides, we're not looking for the murderer, are we? He's safe under lock and key." Angus made no reply. He was holding the fragment of blotting paper up to the window. "This is probably," he observed, "the last letter written by Merridew. He must have had a brother. This is addressed to R. Merridew, but I'm hanged if I can read the rest of it." The inspector crossed the room a little languidly. He was only concerned with finishing up the technical details of his perfect case. He did his best, however, to decipher the remainder of the address. "It's R. Merridew, Esquire, all right," he decided, "and it is at some club in W.C.2. Are you attaching any importance to this, sir?" "This much," Angus said earnestly. "On the face of it, Coulson is undoubtedly the murderer. Curiously enough, however, although he pleaded guilty to the first affair all right, this time he swears that he never killed either of these people. Very well—it's a thin chance enough, but let's give him that chance. If he didn't—if there was anyone else concerned—the last letter written by Merridew might help us." "That's quite right, sir," the inspector admitted doubtfully. "It's some club of two syllables in the W. C. 2 district," Angus went on. "Do you mind my turning my men on it while you finish your job here? If I discover the letter, of course I'll do nothing without you." "Why, you go right ahead, sir," he agreed. "I've got to be able to swear as to the condition of these walls. It will take me about an hour. I shall be at Scotland Yard afterward." Angus, with the sheet of blotting paper in his pocket, took his leave. IT WAS barely midday when Angus, with two of his Strand House employees, started the rounding up of all the social clubs in the district comprised by W.C.2; it was nearly ten o'clock when he found himself seated on a hard cane chair opposite the letter rack of the Alpha Club in Henter Street, W.C.2, watching a letter in the rack and waiting for the arrival of Inspector Ryan, Angus himself under the uneasy observation of a seedy-looking hall porter, collarless and unshaven. An occasional member, pausing on his way in or out, glanced furtively toward him. There were other indications of the fact that the Alpha Club was scarcely an establishment of high social standing, but Angus had only one anxiety—that the letter should remain where it was until the arrival of the inspector. When at last a car stopped outside, not only the inspector himself but also the deputy chief commissioner of police made their appearance. The uniform of the former reduced the hall porter, who had risen to his feet, to stupefied silence. Angus advanced to greet the newcomers. "There's the letter, Inspector," he pointed out, "which, according to my theory, was written by Merridew, on the night of his death, to his brother. If there is any other explanation of the tragedy besides the obvious one, it is to be found there." The deputy chief commissioner turned to the hall porter. "Mr. Merridew is a member of the club?" he inquired. "He's a member, sir," the man admitted, "but he ain't often here." "Do you know where he is now?" "I did hear," the man ventured, "that he was in France somewhere." "You don't know when to expect him back?" "Not exactly, sir. There's a good few as calls here says he owes them money." The deputy chief commissioner withdrew the letter from the rack. "I'm taking possession of this letter in the name of the law," he announced curtly. "Have you a room here where we can be alone for a few minutes?" I can do nothing to help you. It's all up with me, anyway. I have spent my last shilling—sold the car yesterday—and Ada knows it. By the time you get this I shall have gone out. Bob, you've been right to stay free from women. You know what Ada's been to me. Worse and worse, I've been getting for weeks and months. Yesterday I went to a doctor. He didn't spend five minutes over me; looked at me in a queer, old-fashioned sort of way. "Are you honest?" he asked. "You don't know what's the matter with you?" "I'll be hanged if I do," I told him, "or I wouldn't have spent a guinea coming here." "You've either been taking or you've been given arsenic steadily for the last three months," he said. "It's gone too far. I should get into a hospital quick, if I were you. I can do nothing." Arsenic, Bob! What do you think of that? The three men looked at one another. The deputy chief commissioner placed the letter in the envelope, scrutinized the post mark, and, opening the door, called to the hall porter. "This letter," he asked—"you're prepared to swear that it came through the post in the usual way?" "I took it from the postman myself, sir." the man replied. The deputy commissioner shook hands with Angus. "If there is one thing in the world, Mr. Angus," he said, "which could reconcile us to the activities of you amateur gentlemen, it is the fact that you have vision. You have saved us a bad shock this time, anyhow." They had passed out into the stuffy little hall, and for a moment Angus made no reply. He was looking at the dilapidated letter rack. But for a chance that letter in its soiled envelope, addressed in shaky handwriting to R. Merridew, Esquire, might have moldered there behind the worn tape whilst Coulson was hanged. "It's a matter of psychological conviction against circumstantial evidence, sir," he said, after a pause. "Coulson's guilt seemed a certainty, and yet, as man to man, I felt that he was telling me the truth." "That's where the humanity of the thing comes in, Mr. Angus," the deputy chief commissioner confessed. "As man to policeman, he wouldn't have had a chance." TWO months later M. Coulson, smartly dressed in a light-gray suit with racing glasses swung around his shoulder and carrying his derby in his hand, presented himself at Angus' office. He was accompanied by a very charming young woman, neatly dressed for a day's racing. "I've called to know what fee I owe you, sir," Coulson announced. "This is my wife—Sam Martin's daughter. She'd like to help me pay it." "Well, what's his life worth to you, Mrs. Coulson?" he asked. "Everything in the world," the girl answered. "How's your book to-day?" Angus inquired. "We're light on Arioso, sir," was the smiling reply. "I'll have a fiver each way, then." "You're on a fiver to nothing, sir," Coulson announced. "And it's the best bet I ever took in my life!"